Robbi and I are now almost at the end of our journeys for this year and we are looking forward to enjoying some quiet time before our season begins again early next year. Since our last newsletter we have spent a delightful month in the USA visiting Chicago, Minneapolis, Tampa and San Francisco and shortly Robbi will be returning to China to teach a series of her Blossoming Heart workshops. 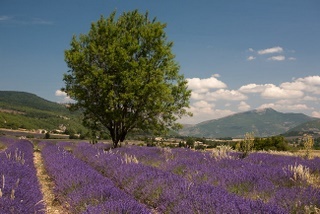 2009 has been a water-shed year for Aroma Tours with another brilliant season of tours and already we are seeing next year's bookings forging ahead. It has certainly been a year full of wonderful travels and delightful people with new friendships made and old ones rekindled. Robbi and I are very excited to see our passion for Aroma Tours coming to fruition and we are greatly looking forward to sharing many more wonderful adventures with our guests next year. We have added two new pages of memorable photos for your viewing pleasure at Memorable Photos 2009-3 and Memorable Photos 2009-4 and we hope that you enjoy them as much as we do. 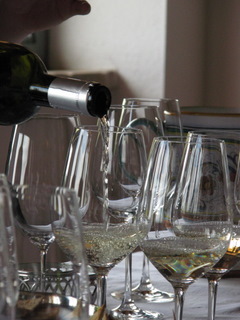 Each year during our Aromas of Tuscany tour we spend a wonderful afternoon at a lovely small enoteca in Umbria where we sample and savour some of the finest wines and produce from across Italy. Time passes slowly and with convivial ease as each gastronomic offering and its perfectly matched wine tantalizes our tastebuds. The wines are exceptional and we are privileged to sample rare vintages, some of whose annual production is only 2000 bottles! We laugh and chat, as tapenades, white truffles and other yummy aromatic goodies arrive as well as finest olive oils [ including the oil that is exclusively used by Alain Ducas in his restaurants ]. All the while we are accompanied by the joyful, deep gonging sound that Italian wine glasses make when they knock together - a poignant reminder that we are indeed in the land of the "Dolce Vita". 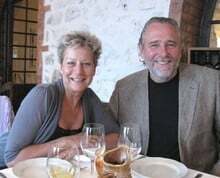 All is now well under way for next year's tour season and Robbi and I are thrilled to see the wonderful early response continuing for all of our 2010 offerings. Now that the Thanksgiving holidays are over we always receive a flow on of bookings, so if you are planning to joining us next year please keep an eye on availability via our Calendar Page. Ephesus finally came under Roman rule in 86BC. Systematic plunder and high taxes were imposed by the new masters, however, in 27BC Augustus lifted the prestige of Ephesus by making it the capital of Roman Asia Minor. 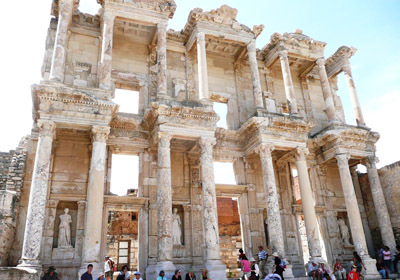 The grandeur of Ephesus is indicated by its buildings such as the library of Celsus ( shown as it is today, above ) which once held nearly 12,000 scrolls, the temple of Artemis, one of the Seven Wonders of the Ancient World and the theatre which seated approximately 44,000 people and is regarded as the largest outdoor theatre in the ancient world. For much of the Byzantine era ( 395-1071AD ), Ephesus remained the most important city in Asia Minor after Constantinople and the emperor Constantine rebuilt much of the city and erected a new public bath. Also in the 6th century emperor Justinian I built a basilica to St. John over the supposed site of the apostle's tomb. The gradual silting up of its harbour and consequenti lost of trade, as well as Arab invaders in the 7th and 8th century, led to Ephesus's decline and by the 15th century it was completely abandoned. Our dear friend and colleague Sal Rodd, who is Robbi's fabulous assistant during our Bali Women's Retreat has long been interested in the plight of the Moon Bears in China. These beautiful bears are incarcerated in a coffin-sized cage on a farms in China or Vietnam, where they are being milked for their bile through an open catheter wound. This cruel practice based on traditional practices is gradually being phased out through the activities of Jill Robinson and her amazing team at Animal Asia's Moon Bear Sanctuaries. Sal has created a website to focus awareness and gather financial support for the work of releasing and recuperating Moon Bears and all money gathered will go towards the adoption and extensive veterinarian care of each bear once rescued. It also gives us the privilege of naming each Moon Bear. The first bear now being rescued has been named "Jigsaw"�. 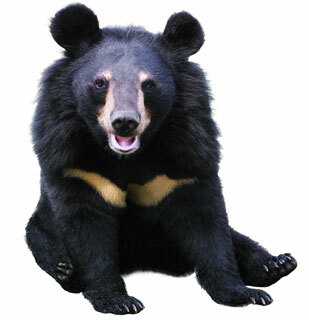 As part of our Aroma Tours annual tithing we are supporting Sal's Adopt A Moon Bear Project. Please join us in Sal's quest to rescue a Moon Bear! Sharing the sacred, nourishing and nurturing week of our Bali Women's Retreat is one of the highlights of Robbi's travels each year and our groups of lovely women from around the world never fail to be enchanted by the gentle spirit of the Balinese people and the beauty of this lush green paradise. If you have not already done so we invite you to visit our memorable photos from our 2009 Bali adventures page to enjoy some of the beauty and serenity of Bali through the lovely images. Bookings for next year's Bali Women's Retreat are already well underway with only 4 places left and we recommend that you get in touch with us shortly if you would like to join us next year. "We all need to experience the world from a different point of view from time to time. Enjoy the familiar but never lose sight of the horizon."